The UFC stuck with Chris Leben (pictured) through his roller coaster career, but the slugger had no problem throwing his former employer under the bus Sunday by claiming he’d be better off today had he driven a truck for the past decade instead of risking life and limb inside the Octagon. “I wish I would’ve drove truck last 10yrs, then at least is have insurance to see a counselor. 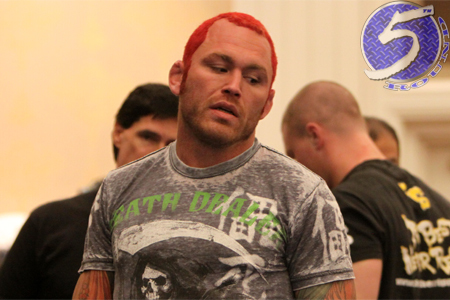 Ufc left me broken with nithing,” Leben cryptically posted on his Twitter account. If Leben is in fact in dire straits, imagine how disastrous his financial predicament would be had he actually paid his taxes like the rest of America’s working world throughout his 12-year fighting career. Leben emerged onto the UFC scene as a contestant on the original “The Ultimate Fighter” back in 2005. He inexplicably quit on the stool after the first round against Uriah Hall at UFC 168 and announced his retirement from MMA shortly after. After Leben’s Sunday tweet started to make its rounds on the Internet, White and the UFC quickly reached out to the struggling 33-year-old. Leben promptly deleted his post and tried to explain his frustration. Obviously, no word on what his former employer did to help Leben try to get his life back on track. “The Crippler” hung up his MMA gloves with a 22-11 professional record. He lost five of his last six scraps, including four straight. He was suspended on two separate occasions (2008 and 2011) for taking banned substances.